Gun violence is an increasingly common phenomenon in American life. Recent FBI research shows that gun homicides were up 32% from 2014 to 2016. According to the Congressional Research Service, there have been nine deadly public shooting events — defined as resulting in at least four casualties due to gun violence, with the victims chosen at random — in the United States in 2017 alone. That’s one per month. Last month’s shooting in Las Vegas, the most fatal in American history, has reignited the public debate about gun access and gun control. Who should be able to buy a gun? How easy should it be? How should the government balance constitutional protections with public safety? Often, the debate over gun control takes place in Congress, on television, and in courtrooms. 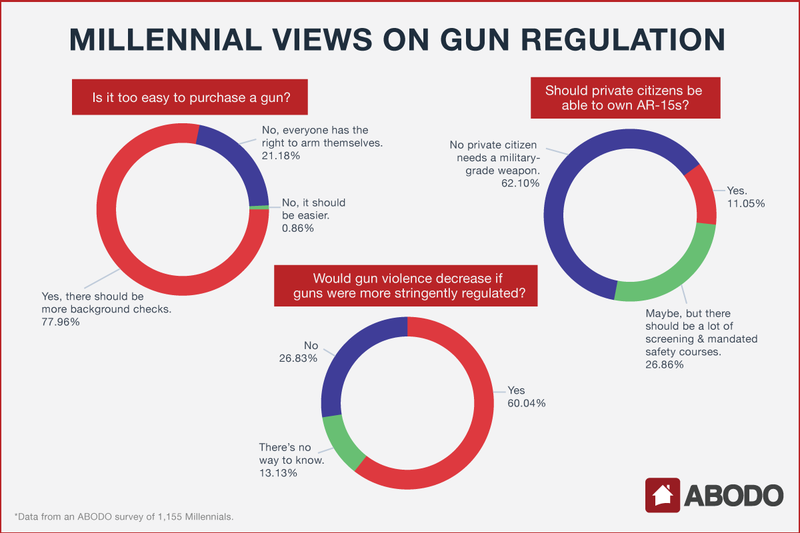 We wanted to see what Millennials — whose opinions and beliefs will help shape public policy in the decades to come — think about gun control. So we surveyed over 1,000 of our users about their beliefs about guns, regulation, and the government’s efforts to curb violence. The shooting at Mandalay Bay might have reignited the debate nationwide, but a majority of Millennials had already made up their mind about gun control. Over half (52%) of respondents said that the events in Las Vegas hadn’t changed their opinion on gun control, while 48% said that the event had made the issue even more pressing. Nearly everyone surveyed could agree that public gun violence is an issue of particular concern for Americans. 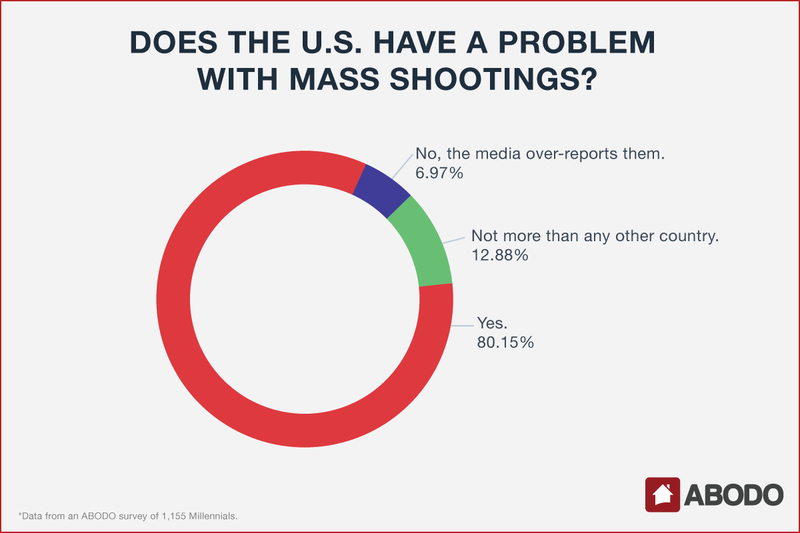 The vast majority of Millennials — 80% — said that the U.S. has a problem with mass shootings. Only 13% said that things in the U.S. weren’t worse than any other country, while a mere 7% claimed that gun violence was over-reported in the media. 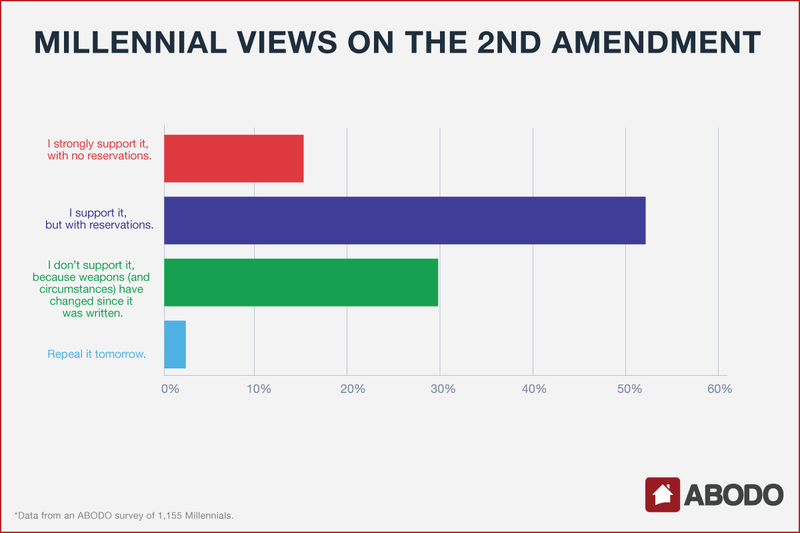 The majority of Millennials we polled support the Second Amendment, but their support is qualified. Only 15% support the Second Amendment unconditionally, while a whopping 52% do so “with reservations.” About 30% believe the amendment to be a relic from an earlier time, in which weapons were less dangerous and the circumstances governing American life were different. A mere 3% go so far as to advocate for its immediate repeal. In general, Millennial respondents to our survey favored increased regulation, at percentages far outpacing the national average. A recent Gallup poll found that 55% of Americans believe that gun laws should be made more strict. In our survey, 78% of Millennials indicated that they believe it is too easy to purchase a gun. And 59% of them believe that gun violence would decrease if gun regulations were strengthened. When it comes to magazine-fed, semi-automatic weapons like the AR-15 — used by the gunmen in the shootings in Aurora, Colorado, in 2015 and the Pulse nightclub shooting in Orlando, Florida, in 2016 — 62% of Millennials believed that no private citizen should be allowed to own one. An additional 26% thought that owners of such a weapon should have to undergo additional screening and mandated safety courses. Regulations for the AR-15 and similar firearms vary by state. So, to recap: Millennials think gun violence is a problem; they largely support the Second Amendment, but also think that it’s too easy to purchase a firearm; and they believe that increased regulation — of all types of firearms, not just assault rifles — would decrease the likelihood of future mass shootings. In other words, they largely believe the government has a responsibility to encourage responsible gun ownership through thoughtful regulation and legislation. How does that translate to the current administration? Do you think the Trump administration is equipped to deal with the contentious gun control debate? The results were dramatic: Only 26% believe the Trump administration was up to the task. Does gun ownership shift one’s perspective on this issue? One might expect that gun-owners would view the Trump administration’s capabilities differently than their peers who don’t own firearms. The percentages do change, when one takes a survey respondent’s gun ownership into account. Of the Millennials we surveyed who do not own a gun, 79% do not believe the Trump administration could handle the issue of gun control. The percentage of gun-owners who don’t have faith in the current administration is lower, but it’s still a majority: 53%. 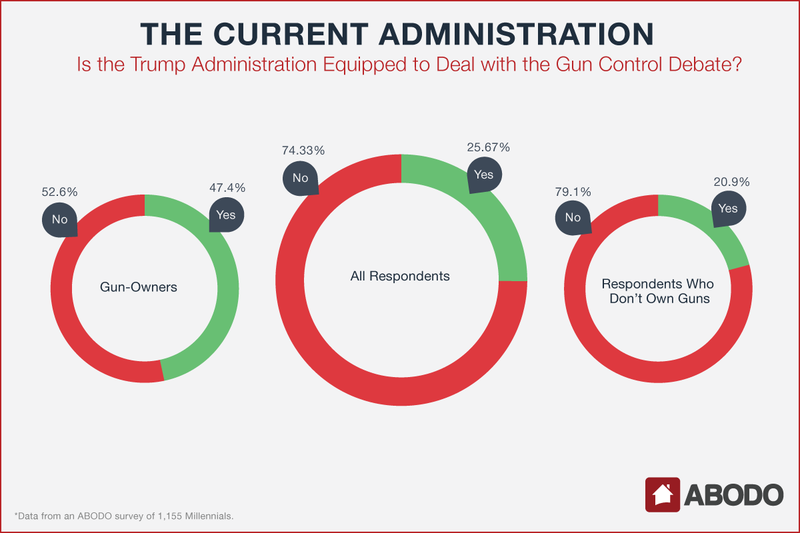 That means that less than half of the gun-owning Millennials we surveyed believe that the Trump administration is equipped to handle gun control. We should note that 81% of the Millennials we surveyed — who hailed from all across the country — do not own a firearm. The percentage of Millennial respondents who indicated that they owned at least one gun was 19%, about 10 percentage points lower than is typically found by surveys of the general population. For instance, in a recent poll by the Pew Research Center, 30% of adults surveyed indicated that they owned a gun, while a CBS poll found 36% did. If our results are any indication, gun ownership might be on the decline in younger generations. That fact — more than any statement of belief or survey response — might shape the gun control debate in the years to come.